Having the training and skills in a life-threatening situation can be the determining factor for survival. Trauma & Emergency Response: (Combined Course) This class is for everyone who wants to be prepared for emergency situations. Learn basic First Aid, CPR and AED in compliance with the standards of American Heart Association. Stop The Bleed - Trauma Response Medical Training: Bleeding Control, Wound Packing and Tourniquets. 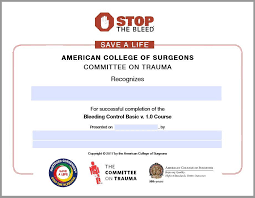 This program teaches proper bleeding control techniques, including the use of hands, dressings, and tourniquets.